Cooler weather often brings busier schedules – balancing family activities, daily chores, and holiday festivities – but it is also a time when you want to look your best. Lower temperatures also open closets to a variety of fashionable seasonal items such as knit tops, delicate formal wear, corduroy pants and more. Successfully cleaning silk without damage means adhering to the care label. Regardless of the care label, if there are stains on the garment, the safest route is taking the garment to a dry cleaner. Rubbing a stain can remove the dye, leaving a permanent faded spot. Washable silk can be hand washed or machine washed on a delicate cycle in cool water. Unless stated otherwise on the care label, air-dry flat or hang on a padded hanger, which can help remove wrinkles. If drying in a dryer, set to a low temperature, delicate cycle. After consulting the care label, wash any clothing containing delicate material with similar colors and keep any hooks fastened to prevent snags. If hand washing, use a small amount of gentle detergent and cold water to soak and rinse. If using a machine, use the delicate cycle. Dry on low heat if the care label instructs; otherwise, hang or lay flat to dry. Almost nothing goes with fall sweaters better than corduroy, but to keep it looking great, some special care is needed. Corduroy picks up lint easily. To wash, turn inside out, separated by color and do not wash with garments such as sweaters or towels that give off lint. Wash darks on cold and lights on warm, unless otherwise directed on the care label. Corduroy can shrink, so after washing, give it a gentle tug lengthwise to reshape before air-drying or tumbling on low heat. Have a lint brush or roller handy to remove lint. Make laundry easier with a smart washer and dryer that feature hands-free commands and remote functions. 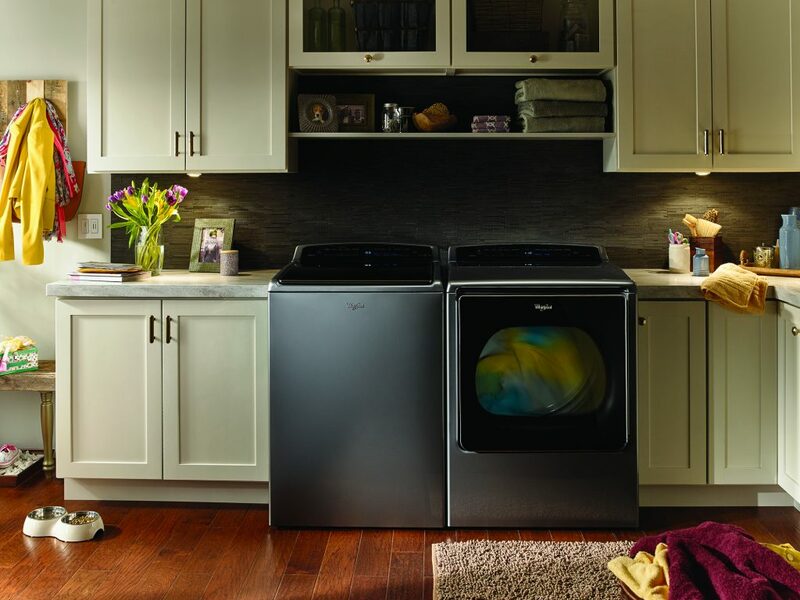 For example, the Whirlpool Smart Cabrio Top Load Laundry Pair offers intuitive touch control panels and pairing via mobile with smart devices such as Amazon Alexa and Nest thermostats. Smart technology provides for conveniences such as checking the time remaining on a load, tumbling items in a dryer so they’re ready for folding when you arrive home, monitoring supplies such as a detergent that may need to be re-ordered and converting to economy mode to align with the thermostat’s away setting. Wool is generally soft and warm, and wool sweaters, socks, and blankets can last for years. Turn wool garments inside out and machine-wash in cool water on a gentle cycle or hand-wash, but do not wring. If hand-washing, gently squeeze out excess water then lay flat on a clean towel and roll up to remove water. Tumble-dry on low heat or as recommended on the care label. Or skip the dryer, reshape the garment and lay flat to dry.